Toy stick horses, sometimes known as hobby horses, are particularly appealing to younger toddlers. Helping develop their imaginations. A younger child will be animated with the life like sounds of the clip clop and neighing sounds. To an older child the toy stick horses help their imaginations take off as they ride off into the sunset to far away lands. This group of toys is excellent for all children and particularly to those who love horses. The toy stick horse is a classic toy and has been around since the end of 19th century. This toy encourages make believe play with a youngster pretending to be the horse. It encourages active play as you have to physically make the horse move. The toy stick horse is a excellent toy for younger toddlers. As soon as they can walk they will be able to use a stick horse. At this age they can simply use it to ride on. Realistic neighing and clip clop sounds add to a child’s delight, as young toddlers just love a toy that makes a noise. This toy encourages the use of children’s imaginations, encouraging them to act out what they have seen in the world around them. There should be no loose parts or anything that will easily fall off your horse. The age ranges suggested by suppliers are only a recommendation. Make sure a toy is suitable for the size and abilities of your child. Some toys produce a sound when their ears are pressed or by some other activity. It should be easy for a young child to take the action necessary to make the sounds. The stick of the horse should be made out of good quality wood to take the wear and tear of use. There should be no splinters sticking out and ensure it is well varnished. 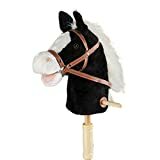 The toy stick horse should look like a realistic horse so a child is encouraged to use their imagination. A toy with a history. Toy stick horses are a classic toy and have been around for centuries. The term ‘Hobby Horse’ dates back to the era of King Henry VIII of England (the one with six wives). Henry and his court enjoyed all forms of gambling and King Henry introduced a stable of horses bred specifically for racing. These were referred to as his ‘Hobby Horses’ – from the Middle English word ‘hobi’ or ‘hobyn’ meaning a small horse. The term ‘hobby’ then became synonymous with any ‘Activity or interest pursued outside one’s regular occupation and engaged in primarily for pleasure’. The word ‘hobby horse’ was then given to the name of a stick toy with the head or figure of a horse, on which boys make believe to ride. A toy that is ready to use – now. What more can you want than a toy that is ready to use straight away, is easy to store and easy to wipe clean. Put that tool box away! No assembly required for this one. Clip, clop, get up and go. The horse is a dressing up outfit with a horses head and feet which your child puts on. Your toddler pretends to be the horse rather than with the traditional hobby horse where the child is the rider. The headgear has different sounds including a neigh, whinny and a clip clop, which is triggered by the actions that the child makes. It really encourages active imaginative play. 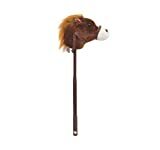 Your child can use a toy stick horse to release their imagination. The horse on be on a farm. Let’s ride on the farm, and visit the other farm animals. On our farm we have cows, pigs and my horse. I like to look after all the animals. I feed my horse, water it and brush its hair.I put on my Wellington boots and get a brush to sweep up my toy stick horses’ stable. We can play show jumping – make an obstacle course and jump over the different fences. Horse races – everyone line up behind the tape, on your marks, get set, and go ! I can feed my horse and make a nose bag. Let’s put the horse in her stable (my playhouse), and put some grass down for it to lie on which is the straw. Ride off to faraway lands. This toy will be used time and time again. It’s very suitable for girls with 3 attractive designs to choose from. This horse is 33” in length and is easy to store. Excellent value. The Easy Ride ‘um brown horse in this range is more suitable for boys and has realistic neighing and galloping sounds. Mary Meyer Fancy Prancers, Fancy Prancer Princess Pony, 33"
– Busy mother with a great eye for toys. Is there an alternative to Toy Stick Horses ? You’ll find some interesting alternatives to Toy Stick Horses in our review of Brio toys for Kids or you may select another toy category from the sidebar. Let your toddler engage in the sights, sounds and feelings of a dinosaur. How your children move determines what sounds they make. Aimed to encourage imaginative play, this is a good alternative dressing up outfit – especially for a boy. The sounds include a roaring sound, a thunder sound and a real dinosaur breath. If you want to walk the dinosaur this is the way to do it. Prices are accurate as of April 25, 2019 4:17 am. Product prices and available are subject to change. Any price and availablility information displayed on Amazon.com at the time of purchase will apply to the purchase of any products.